The Los Angeles Zoo and Botanical Gardens is a 133-acre (54 ha) zoo founded in 1966 and located in Los Angeles, California. The city of Los Angeles owns the entire zoo, its land and facilities, and the animals. Animal care, grounds maintenance, construction, education, public information, and administrative staff are city employees. The first zoo, called the Griffith Park Zoo, opened in 1912 and was located about two miles (3.2 km) south of the current zoo site until it was closed in August 1966. Remnants of the original zoo remain. The site of the current zoo was formerly the location of Rodger Young Village, which was itself built on the land which had been used for the Griffith Park Aerodrome. The zoo opened in its present location in November 1966. By the early 1990s, the zoo's infrastructure was deteriorating. In January 1992, a ten-inch water pipe burst, leaving half of the zoo without water. The next day, city officials passed a $300 million master plan that had been recently drafted to deal with the infrastructure problems and inadequate exhibits. The zoo nearly lost its accreditation in 1995 because of deplorable conditions; however it rebounded under a new director. In 1998, the zoo opened Chimpanzees of the Mahale Mountains, followed by Red Ape RainForest in 2000, the Komodo Dragon Exhibit, the Winnick Family Children Zoo in 2001, the Entry Plaza, Children's Discovery Center and Sea Lion Cliffs (now Sea Life Cliffs) in 2005, Campo Gorilla Reserve in November 2007, Elephants of Asia in the winter of 2010, and the LAIR (Living Amphibians, Invertebrates, and Reptiles) in 2012. On Tuesday, June 26, 2012, a chimpanzee infant baby, born to Gracie, a member of a 15-chimpanzee tribe (one of the largest chimpanzee tribes of any North American zoo), was mauled to death by an adult male chimpanzee. The zoo said this event was totally unexpected, although it also stated that acts of aggression by male chimpanzees (toward humans, or toward a rival male chimpanzee over territory or a desired female) are always a possibility—indeed, there have been several well-known cases of male chimpanzee aggression in recent years. Gracie was allowed to keep her baby overnight to grieve, and counseling was being offered to staff (none had witnessed the event), and to the visitors who had seen the event. It is reexamining its policy of how it introduces baby chimpanzees to the tribe. The Los Angeles Zoo has had a number of notable escaped animals over the years. A particular spate of escapes took place during the late 1990s and early 2000s when, in half a decade, at least 35 animals escaped the zoo including zebras, chimps, kangaroos and antelopes. Evelyn, the gorilla, escaped her enclosure approximately five times. In one widely covered incident, she used some overgrown vines to pull herself out of her exhibit. She then had full run of the zoo for an hour as TV-news copters hovered overhead and visitors were evacuated before she was tranquilized. In a prior incident, she hopped on the back of another gorilla, Jim, to make her escape (Jim had also previously escaped). Part of the problem was the gorilla habitat was originally intended to house bears. The situation was relieved by the opening of the specially designed Campo Gorilla Reserve in 2007. In 1979, Virginia, the wolf, escaped the zoo multiple times by ascending trees, climbing fences, and walking along branches until she could escape. At one time she eluded capture for a month by hiding in Griffith Park. It is unclear whether Virginia was ever recaptured. In 2014, a bighorn sheep escaped from its enclosure, and ultimately the zoo itself. It was struck by a car approximately three hours later, and subsequently died. 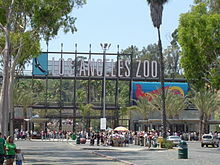 In 2002, the zoo became a certified botanical gardens and the official name of the institution was changed to the Los Angeles Zoo and Botanical Gardens. Spread throughout zoo grounds, there are 15 different collections, highlighting over 800 different plant species, with a total of over 7,400 individual plants. Chimpanzees of Mahale Mountains, a one-acre (0.4-ha) exhibit complex, opened in 1998 and houses chimpanzees. The hillside exhibit is dotted with boulders, palm trees, and an artificial termite mound, and features a waterfall next to a tall rock ledge where the troop's leader can survey much of the area. Guests can view the animals across various moats or through a glass viewing window. Campo Gorilla Reserve opened in November 2007 and features western lowland gorillas in a 1.5-acre (0.61 ha) complex. Guests can view the animals through two glass observation windows and three other locations. Plants in the exhibit include palms, pomegranates, and ferns. This $42 million exhibit complex at the center of the zoo opened in 2010 and houses Asian elephants and other southeast Asian wildlife. The main elephant enclosure is 3.8 acres (1.5 ha) and has a 16,000-square-foot (1,500 m2) barn used for medical exams. The complex is divided into several areas, each based on a different country in the elephants' range. The Thai Pavilion teaches visitors about the role of elephant labor in Thailand's economy. Guests can find information about elephant conservation in India at Elephants of India Plaza, which also has a waterfall where the animals can bathe. The Elephants of China section houses sarus crane and Chinese water deer in a marsh habitat and has information about the history of the Dai people and their relationship with elephants. The LAIR (Living Amphibians, Invertebrates, and Reptiles), which opened in 2012, is a $14 million indoor-outdoor exhibit complex that focuses on herps and terrestrial arthropods. Guests first pass through the Oak Woodland Pond, where local species can move in and live among native plants. The next feature is the 6,000-square-foot (560 m2) main building where the Damp Forest houses poison dart frogs, Chinese giant salamanders, and a recreation of a Daintree Rainforest river with archerfish, Australian lungfish, and Fly River turtles. The Mangshan pitviper, west African green mamba, South American bushmaster and other snakes live in the next segment of the building, Betty's Bite and Squeeze Room, named after GLAZA co-chair Betty White. Guests can see keepers care for animals behind the scenes in the Behind the Glass room. The Care and Conservation Room showcases Gray's monitor and other endangered reptiles. After the main building is Arroyo Lagarto, a set of outdoor exhibits for Madagascar radiated tortoise, Madagascar spider tortoise, desert lizards, and California desert tortoise. A 2,000-square-foot (190 m2) secondary building, the Desert LAIR, houses the Gila monster, Sonoran toad, Arizona Desert hairy scorpion, California kingsnake, and other species from Mexico, Arizona, and Southern California. The LAIR ends with Crocodile Swamp, an outdoor exhibit home to false gharials. Red Ape Rain Forest, a recreation of a Southeast Asian jungle, opened in 2000 and houses Bornean orangutans. The 6,000-square-foot (560 m2) mesh enclosure, which has openings for the guest path to go through, is shaped like a horizontal donut and back-dropped by hibiscus, bamboo, and rubber trees. The apes can climb on artificial sway poles, branches, and vines placed throughout the exhibit or wade in a shallow stream. Visitors enter the exhibit through an Indonesian pagoda, continue over the stream on a deck bridge, and arrive at a small pavilion with a glass viewing window. The path next leads to a large central deck where guests can view the entirety of the surrounding exhibit. Afterwards, guests proceed to an interpretive area with traditional Indonesian folklore and exit the exhibit area through another pagoda. "Rainforest of the Americas" features animals who live in the tropical regions of North, Central, and South America. It opened in 2014 and houses the uakari, southern black howler monkey, red-bellied piranha, keel-billed toucan, harpy eagle, Goliath bird-eating spider, giant river otter, emerald tree boa, cotton-top tamarin, Baird's tapir, jaguar and other species. The Los Angeles Zoo has been successful in its breeding program of the rare California condor, helping to grow the number of condors in the world from a low of 22 in the 1980s to over 430 today. It is one of the few zoos worldwide to have the mountain tapir. The Greater Los Angeles Zoo Association (GLAZA) was created in 1963 and is a nonprofit corporation created to support the Los Angeles Zoo in its mission to nurture wildlife and enrich the human experience. GLAZA's primary responsibility is to seek and provide financial support for the zoo's programs and capital projects. GLAZA also provides support through membership, organizing special events and travel programs, producing award-winning publications, coordinating one of the largest zoo volunteer programs in the country, administering the contract for visitor services concessions within the zoo, and supporting community relations, and public relations. Named after philanthropists Robert and Suzanne Gottlieb, the Gottlieb Animal Health and Conservation Center is a 33,589-square-foot (3,100 m2) facility situated in a restricted area in the upper reaches of the zoo. Among other features, it includes a state-of-the-art intensive care unit, an on-site commissary, a surgical suite with observation area, and research facilities. In 2007 the facility handled 853 medical cases. The smallest patient treated was a spider tortoise (0.08 kg) and the largest was an Asian elephant (4,826 kg). California Condor Rescue Zone (CCRZ): The CCRZ is a play space designed for children ages 6 and up, where they can learn how California condors are protected. World of Birds Show: Birds of prey and other endangered birds perform. Show times: 11:30am and 3:30pm, daily, except Tuesdays. The World of Birds Show is currently running but the birds are still in training. Animals & You Program: These 15-minute-long animal presentations take place at stations in the Winnick Family Children's Zoo. Winnick Family Children's Zoo: Located at the top of Winnick Family Children's Zoo, this petting zoo enables visitors to pet goats and sheep in an animal contact area known as Muriel's Ranch. Brushes are available at Muriel's Ranch for visitors to groom the domestic animals. Neil Papiano Play Park: The Neil Papiano Play Park (located in the upper zoo along the perimeter road) incorporates animal-themed climbing sculptures, large play structures, a toddler area, water misters, grassy landscaping, and a large picnic area. It was designed to be accessible to all children visiting the zoo, including those with medical and physical challenges. The North Hollywood High School Zoo Magnet Center is located across the street from the Los Angeles Zoo and Botanical Gardens in Griffith Park. The program was established in 1981 in the hopes of "a vision of providing a racially, ethnically, economically, and geographically diverse group of motivated students an enriched curriculum in animal and biological sciences." The Zoo Magnet Center offers 300 Los Angeles high school students a college preparatory curriculum focused on animal studies and biological sciences. It is also run by the Los Angeles Unified School District. The Los Angeles Zoo and Botanical Garden's partnership with the Zoo Magnet Center provides high school students with opportunities to study and to practice wildlife conservation, animal care, biology, chemistry, and environmental stewardship in a hands-on environment. ^ a b c d e f g h "About the Zoo". lazoo.org. Los Angeles Zoo. Retrieved December 2, 2010. ^ "List of Accredited Zoos and Aquariums". aza.org. Association of Zoos and Aquariums. Retrieved December 2, 2010. ^ "Zoos and Aquariums of the World". waza.org. World Association of Zoos and Aquariums. Retrieved December 2, 2010. ^ a b "History - Los Angeles Zoo and Botanical Gardens". lazoo.org. Greater Los Angeles Zoo Association. January 16, 2012. ^ "Massive Renovation Plan Proposed for L.A. Zoo". latimes.com. Los Angeles Times. Archived from the original on January 7, 2012. ^ a b L.A. Zoo Wrestles WIth Gorilla Escapes, ABC News, December 18, 2000, accessed April 13, 2013. ^ a b Josh Sanburn, Evelyn the Gorilla, Los Angeles, Time, March 30, 2011, accessed April 13, 2013. ^ Josh Sanburn, Virginia the Wolf, Los Angeles, Time, March 30, 2011, accessed April 13, 2013. ^ "Bighorn sheep escapes Los Angeles Zoo, dies after car strikes it". Reuters. November 23, 2014. Archived from the original on December 3, 2014. ^ "L.A. Zoo Expands Chimpanzee Troop with Three Youngsters". lazoo.org. Greater Los Angeles Zoo Association. May 29, 2013. Archived from the original on December 22, 2013. Retrieved April 9, 2014. ^ Coe, Jon Charles (1999). "Increasing Affiliative Behavior between Zoo Animals and Visitors" (PDF). joncoedesign.com. Jon Coe Design. Archived (PDF) from the original on January 27, 2014. Retrieved April 9, 2014. ^ "Gorillas Again in Our Midst". latimes.com. Los Angeles Times. November 8, 2007. Archived from the original on April 29, 2009. ^ a b "Los Angeles Zoo Unveils Campo Gorilla Reserve" (PDF). lazoo.org. Greater Los Angeles Zoo Association. Archived (PDF) from the original on January 1, 2012. ^ "Exhibit Information". lazoo.org. Greater Los Angeles Zoo Association. Archived from the original on January 20, 2013. Retrieved May 27, 2013. ^ "Habitat". lazoo.org. Greater Los Angeles Zoo Association. Archived from the original on March 11, 2013. Retrieved July 23, 2013. ^ "Critters". lazoo.org. Greater Los Angeles Zoo Association. Archived from the original on March 11, 2013. Retrieved July 23, 2013. ^ "Red Apes of the Rainforest". joncoedesign.com. Jon Coe Design. Archived from the original on March 21, 2012. Retrieved August 15, 2013. ^ Coe, Jon (1997). "Red Apes of the Rain Forest". lazoo.org. Greater Los Angeles Zoo Association. Archived from the original on February 10, 2001. ^ "Los Angeles Zoo Kicks Off Construction of New $5 Million Orangutan Habitat". lazoo.org. Greater Los Angeles Zoo Association. May 24, 1999. Archived from the original on June 17, 2000. ^ "Animals". lazoo.org. Archived from the original on August 11, 2014. Retrieved September 21, 2014. ^ "Conservation - Los Angeles Zoo and Botanical Gardens". lazoo.org. Greater Los Angeles Zoo Association. January 6, 2012. ^ "Greater Los Angeles Zoo Association". lazoo.org. Los Angeles Zoo. Retrieved December 2, 2010. ^ McManus, Lee. "NHHS Zoo Magnet Center".